I had this coat bought for me for my 18th Birthday, and let me tell you it is truly wonderful! The fabric is daily thin yet doesn't feel cheap in the slightest! The lining is beautiful and the whole coat is stitched together beautifully. The coat looks and feels fantastic, you really feel like running down corridors while wearing this coat as it flaps in the wind. My only critiques are the shoulders are just a bit too wide and are about an inch wider than the measurements I provided, and the external pockets are a bit too shallow for my liking. However that cannot detract from the wonderful craftsmanship that went into the design and tailoring of this coat! 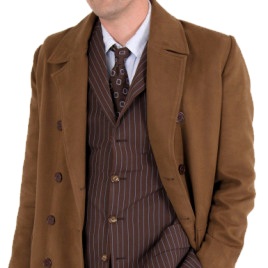 I definitely recommend this coat to any Tennant fans with a spare bit of dough laying around!